Stay tuned for more stories and pictures--as we travel back to our babies!!!! Looks like ya'll are having fun! Enjoy your kid-free vacation and have fun with the other quad mamas! I am so happy for all of you - to meet together, share some fun times and to share in your combined miracles. Can't wait to see more! OH wow! I can't wait to hear the fabulous stories!!!! Yall look amazing!! So glad you guys got to meet!! I must join next time! Mari You Blonde Beauty....Had a GREAT time with you over the weekend and look forward to many memories ahead of us! Have an awesome trip back HOME! Mari, you guys are AWESOME! Not only are you a BLAST to hang out with but you are wonderful people as well. Girl.. you guys are the complete package! We love you both and can't wait for all the fun times to come. You are amazing! Thank you for being part of our lives. We are sooo blessed! WOW!! How much fun!! I am so glad all of you had a chance to spend the weekend together!! I popped over from the McNulty and Steece blogs. Looks like you all had a blast! Looks like loads of fun! Maybe a little more fun than bed rest, but no complaints here. I feel blessed to be on the journey. Hope you had a blast! Looks like you guys and gals had a great time. So glad you got to get together and I can't wait to see more photos and videos from your adventure! You girls are both beautiful on the inside and the outside! I am so glad you got to get away for a little weekend trip with the hubbies. You guys should make it an annual trip that you go on. 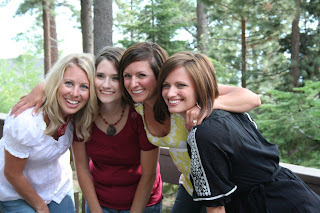 Just think, if God hadn't picked each of you to be Quad Mom's you would have never met...it was meant to be! Can't wait to hear about this weeks adventure with the little ones. Much Love!